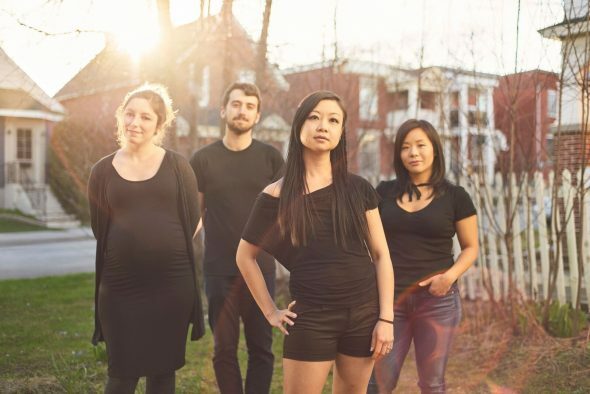 Spotlight on Marvest: Scary Bear Soundtrack - Spotlight Ottawa	:: Spotlight Ottawa - Your local music scene. Get out and experience it! We were pleasantly surprised – it’s been a great year of performing at festivals for us and we’re stoked that our festival season will continue. I don’t remember who the first person I told, but it was probably my bandmates to see if they were free to play the show. Scary Bear Soundtrack is an Ottawa-based indie dream pop project fronted by multi-instrumentalist Gloria Guns, prominently featuring synths, layered vocal harmonies, and reverb guitar sounds processed through chorus pedals and vintage amps. My mother put me into classical piano lessons when I was five years old, as many Korean parents do. I learned a lot of important skills, gave up piano for a while to take up the electric guitar as a rebellious teen, and then returned to keyboards as an indie synth pop musician. Pretty sure that is not what my parents expected me to do with all of those Royal Conservatory of Music lessons, but I’m still grateful that they got me started. Just for this show only, we’ll be doing a special performance as a three piece, so I’ll be playing both guitar and synths, sometimes at the same time, which should be fun to watch. We’ll definitely be playing at least one brand new song that we’re planning to record soon, and also a few old classics updated with a new twist, featuring 8-bit video game sounds. Also, on a whim, we decided to sing one of our original songs in French instead of English, just for fun.